The MTA announced that it is looking to bring back the W train line when the Q begins to run on 2nd Ave.
MTA New York City Transit is proposing to hold a public hearing on restoring the W Line in Queens and Manhattan this fall, in order to allow the Q Line to begin serving the Second Avenue Subway between 63rd and 96th streets when it opens later this year. The Second Avenue Subway’s first phase will serve the existing F Line station at Lexington Av/63 St as well as three new stations at 72 St, 86 St and 96 St., integrating them as one system into the existing subway network – an unprecedented accomplishment in the MTA’s modern existence. MTA Capital Construction will also award final contract modifications on work for the first phase in line with the established budget for the project. Both measures will be presented to the MTA Board for approval at public meetings next week. MTA Capital Construction continues to reach important construction milestones along Second Avenue. The 96 St Station has been fully energized with a permanent power supply, after successfully switching over from temporary construction power. In addition, the project’s final track crossover was completed north of the 72 St Station, allowing trains to switch tracks when necessary. Adding the W Line to the system will provide more choices to Queens and Manhattan customers who use the Broadway NQR Lines, as well as allow New York City Transit to prepare for a seamless transition and connection of service between those lines and the Second Avenue Subway. New York City Transit is proposing to hold a public hearing on this service proposal in spring, in order to implement it by fall. The proposed service changes would return the W to Astoria, where it will operate local service into Manhattan and terminate at Whitehall St. The line would effectively replace Q service in Queens. The Q Line will temporarily terminate at 57 St/7 Av, but will continue to 96 St upon completion of the Second Avenue Subway. In addition, N trains will operate express in Manhattan from 34 St-Herald Sq to Canal St, a change from its current local service in Manhattan. R service would remain unchanged. 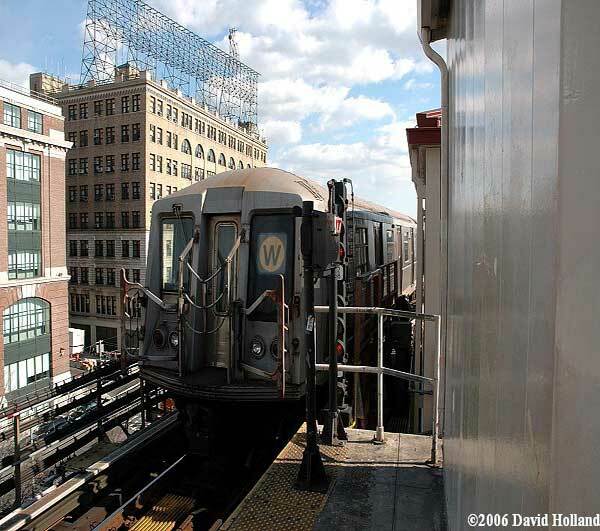 • N Line: Service in Queens and Brooklyn remains the same, but trains operate express in Manhattan on weekdays during peak hours, midday and evenings. • Q Line: Northern terminus temporarily changed to 57 St/7 Ave until the Second Avenue Subway opens. At that point, trains will operate from 96 St in Manhattan to Coney Island-Stillwell Av in Brooklyn, stopping at: 86 St, 72 St, Lexington Av/63 St, 57 St/7 Av and all express stops on the Broadway Line in Manhattan. During late nights, the Q will run local between Brooklyn and Manhattan via the Manhattan Bridge. Service in Brooklyn remains the same. • R Line: No service changes. • W Line: Restoration of weekday service, making all local stops from Astoria-Ditmars Blvd to Whitehall St via the Broadway Line. No service on weekends or late night. The proposed service changes will provide a cross-platform transfer to the F Line at Lexington Av/63 St, giving customers an easy transfer to and from the Second Avenue Subway that will help alleviate current overcrowding conditions on the Lexington Avenue Line. The changes, including the restoration of the W, maintain service frequency and loading guidelines for customers in Astoria and avoid significant deviations from current service that might confuse customers on those affected lines. Customers on the Broadway Line will also benefit from an increase in choices for express and local service in Manhattan. If the changes are approved, they will be implemented in fall 2016. The new terminus for the Q Line would be implemented after the Second Avenue Subway opens, with the extension of Q service to 96 St.
W service was previously eliminated as part of service cuts implemented by the MTA in 2010 as a result of a global economic downturn that led to significant decreases in funding across all MTA agencies. I have to admit that as a transit enthusiast, I am excited to hear about the return of this line. I actually used it a lot during its existence as it ran pretty decently & most times I could always get a seat even during rush hour which is saying something!